Polycystic ovary disease is a condition in which there are many small cysts in the ovaries, which can affect a woman's ability to get pregnant. ¬ Polycystic ovary disease affects hormone cycles. Hormones help regulate the normal development of eggs in the ovaries. It is not completely understood why or how hormone cycles are interrupted, although there are several ideas. ¬ Follicles are sacs within the ovaries that contain eggs. 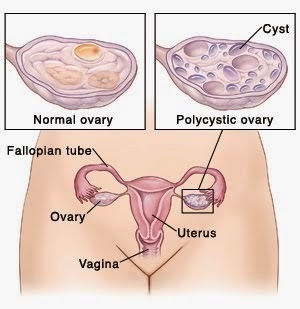 In polycystic ovary disease, there are many poorly developed follicles in the ovaries. The eggs in these follicles do not mature and, therefore, cannot be released from the ovaries. Instead, they form cysts in the ovary. ¬ This can contribute to infertility. The immature follicles and the inability to release an egg (ovulate) are likely caused by low levels of follicle stimulating hormone (FSH), and higher than normal levels of male hormones (androgens) produced in the ovary. ¬ Women are usually diagnosed when in their 20s or 30s. Women with this disorder often have a mother or sister who has symptoms similar to polycystic ovary disease.